German hunting enthusiasts bred the German Short haired Pointer (GSP) in a quest to develop a multi-purpose hunting dog that could track, point and retrieve across both land and water. It is thought that the GSP comes from combination of breeds including the English Foxhound and the Spanish and English Pointers. 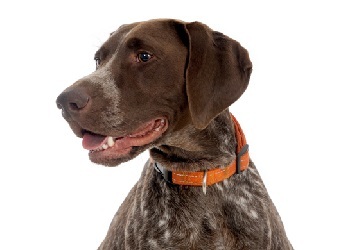 The GSP has webbed feet and a long muzzle with an exceptionally strong jaw for the purpose of carrying prey. The breed was recognized in the late 1800s. The German Shorthaired Pointer is a noble, smart and confident dog with powerful long legs that enable it to run fast and turn rapidly. This breed is highly-energetic and likes to be kept busy. They are adept at agility and make great companions for a game of fetch, Frisbee or a long run. GSPs are people-oriented, affectionate dogs. They are also alert, loyal and protective. As such, they make good guard dogs, and if trained well, they are excellent house-mates, but they are late to mature and keep many of their ‘puppy’ traits well into adulthood. GSPs have a short coat and are not needing a lot of brushing. A weekly brush and the occasional bath is perfectly fine for this breed. They have enormous appetites and need to be fed the right amounts of food to match their energy levels, but they can be prone to weight gain and this is not good for their athletic frames. Like all dogs, German Short haired Pointers require regular tick, flea, intestinal worms and heartworm treatments. Consult your veterinarian on treatment options. Desexing and vaccination against diseases, such as the deadly parvo virus and highly infectious canine cough, are also important to discuss with your vet. Best suited to active couples or families, the GSP is happy to be part of any action. These dogs need to be exercised for at least an hour every day, and their mental stimulation is important too. If bored, they can become hyperactive and destructive. While GSPs can be happy in small spaces (e.g. apartments/townhouses) the biggest consideration wherever they live is exercise. GSPs need to be able to burn off excess energy and this means a vigorous daily walk or run. They are friendly dogs with a cheerful disposition and are generally not aggressive, but they can be very protective of their owners and this needs to be managed carefully. Common hereditary problems Hip Dysplasia is common, ear infections can be prevalent – ears need checking regularly.